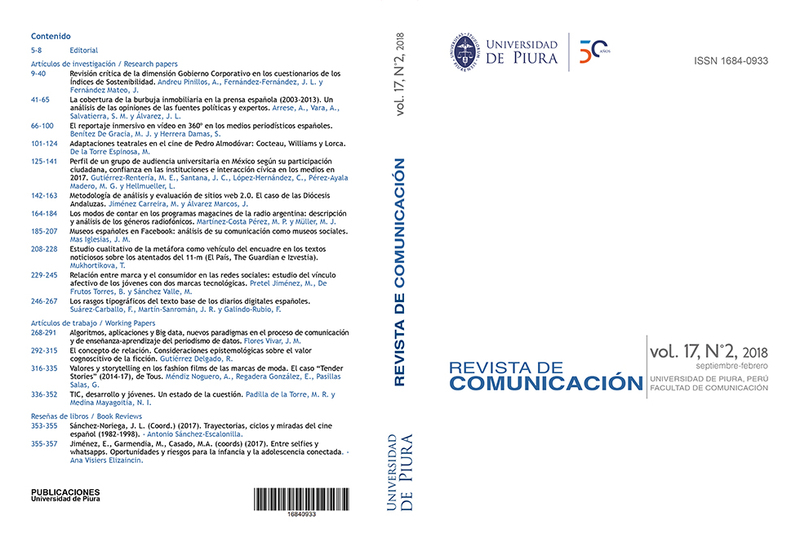 The Revista de Comunicación is an academic journal of the School of Communication of the Universidad de Piura. The publication aims to disseminate material of high theoretical, philosophical, methodological and empirical quality, on issues of communication developed in both the academic and professional field. The editorial criterion that leads the publication is the knowledge acquired through research on communication issues and their practice. The content and selection criteria of the articles in the publication agree with the purposes that inspire the Guiding Principles of the Universidad de Piura. It is aimed at academics, scientists, information professionals, the communication industry, and students of Communication Faculties. Revista de Comunicación is a non-profit project. It does not pay the authors, nor does it charge for the costs of processing the articles and nor for their publication. The journal provides immediate Open Access to its printed and digital content. Self-archive conditions allow Authors to reuse published works, including depositing them in institutional, thematic repositories or personal web pages. Readers have the right to read, download, copy, distribute, print, search, or link to the full texts of articles published in the journal, when they are used for any legal purpose and according to the Creative Commons Atribución-NoComercial 4.0 Internacional (CC BY-NC 4.0) license. The journal uses different archiving repositories where the publication is hosted: SCOPUS, WEB OF SCIENCE, SCIELO, DOAJ, LATINDEX, REBIUNREDIB, DIALNET, MIAR, C&MMI, CONFIBERCOM, JSM, EBSCO, ERIH+, MENDELEY, etc. The Revista de Comunicación promotes an ethical commitment of all actors involved in the management and publication of the articles: Editorial Board, authors and manuscripts evaluators. The Editorial Panel of the Revista de Comunicación is composed of the Editor, and Deputy Editors. They are responsible for ensuring scientific quality of the contents published in the journal. It has an Advisory Council which endorses the Board qualitatively. The Editorial Board must be impartial when managing the work proposed for Publication, and must respect the intellectual independence of the authors. The Editorial Board has an obligation to maintain confidentiality about the texts received and its contents until these have been accepted for publication. Only then can their title and authorship be spread. The Editorial Board ensures that published research papers have been evaluated by two specialists in the field, and that the review process has been fair and impartial. The Revista de Comunicación uses the double-blind procedure (anonymity of authors and reviewers). When one of the two assessments is negative, a third report will be requested. The Editorial Board decides to accept or reject a paper for its publication on the basis of evaluation reports. A form - available to the authors- reflects the opinion on the quality of the papers: relevance, originality and clarity of exposition. The papers lacking the required level of quality, adaptation to the scientific objectives of the journal, originality, or papers that have been plagiarized, are considered inappropriate for the journal. The rules authoring, and presentation of originals are public and are included in the Guide of Contributions of handwritten and digital editions. The Editorial Board should refrain from participating with articles in the journal to avoid conflict of interest. The texts submitted for publication must represent the unpublished fruit of original research. They must include the data obtained and used as well as an objective discussion of the results. Attribute the source of the ideas properly. Specific rules are in the Guide of Contributions. The authors must not send the journal original manuscripts which were submitted for consideration in another journal, nor sent that original to another journal until they receive a rejection or until they voluntarily withdrawn it from consideration. The author who appears as responsible for the article to the journal in the case of multiple authorship, must ensure recognition of those who have contributed significantly in the conception, planning, design, implementation, data collection, interpretation and discussion of the results of the research. The existence of any commercial, financial or personal relationship, that may affect the results and conclusions of a paper, must be contained in a declaration accompanying the article text. It is required to refer to all sources of funding granted for the study, which will be published in the article. a) Revista de Comunicación is published under a Creative Commons 4.0 license. The works are also published in the online edition of the journal under a Creative Commons Attribution-NonCommercial 4.0 International License (CC BY-NC 4.0): it can be copied, used, disseminated, transmitted, exhibited, etc. b) The authors guarantee the journal the right to be the first publication. c) Authors may separately establish additional agreements for the non-exclusive distribution of the version of the work published in the journal (for example, placing it in an institutional repository or publishing it in a book), with an acknowledgment of its initial publication in this journal. d) Between the years 2002 - 2011 the Revista de Comunicación had only the printed edition, reserved the author's rights and did not admit reproduction of the published contents without the express permission of the authors and / or the publisher. Since 2012, when publishing the first digital edition, the journal provides Open Access to its printed and digital content under a Creative Commons license. People involved in the assessment, peer experts in every area of ​​communication, play an essential role in the process that guarantees the quality of the publication. They assist the journal’s organs in making editorial decisions and help in improving the articles. A person conducting an evaluation should consider the work to be reviewed as a confidential document until its publication, not only during the review process but also after this. The evaluator should objectively judge the quality of the entire work: the scientific research, the relevance of the problem, coverage of the literature review, the study hypothesis, methodology; depth of analysis, the quality of the findings, clarity in the structure and organization of the text. The items are contained in the Evaluation Form. Criticism must be justified and also must be constructive, respecting the intellectual independence of the author. The evaluator can make additional comments to the editor about the global vision of the manuscript and its relevance, if necessary. The assessment should verify the citations of relevant papers already published on the subject. For that purpose, the evaluator will review the literature contained in the text, recommending the incorporation of relevant books that have not been cited. The person conducting an evaluation must reject the revision of a paper when he or she has a professional or personal relationship with any of the people involved in the authorship which may affect his/her judgment on such work. The authors declare to have respected the ethical principles of investigation and to be free of any conflict of interest.